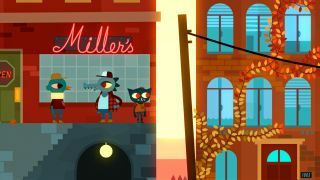 Night in the Woods is a 2D adventure/exploration game starring a cat named Mae who returns to her hometown after a dropping out of college to discover that things aren't quite as she remembers them. It's all about running, jumping, astral projection, wasting time with loser friends, discovering secrets, playing bass, and breaking stuff—potentially very cool, in other words. It came out of Kickstarter in the fall of 2013 with more than four times its $50,000 goal, but the “estimated delivery date” of January 2015 didn't happen. Fortunately, the wheels of development have continued to turn, and developer Infinite Fall announced today that the game will be out later this year. It's not the most precise announcement ever, but it's nice to know that things are firming up, even if there's still a wait ahead. For now, you can find out more about the game at nightinthewoods.com.